In preparation for this Fathom Event, I went back to an excellent post written my my friend Michael for his own blog three years ago. 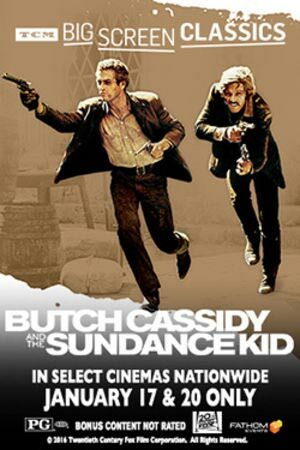 “An Appreciation: Butch Cassidy and the Sundance Kid” is well worth your time. There are nuances that I found really interesting and anybody who loves Butch and Sundance should love it. I also know that sitting somewhere on the other side of town, Michael was enjoying the same experience I was because there is no way he would miss an opportunity to see this wonderful film on the big screen. I myself wrote about this film for the final post I did for “Fogs Movie Reviews“, a site that I contributed to for several months before its ultimate retirement. That post was about the three great Westerns of 1969. Today I am going to focus exclusively on the George Roy Hill film. As Ben Mankiewicz said in his intro to the film today, it was the biggest film of 1969.That was an understatement, it made over a hundred million dollars and that was more than twice as much as any other film made that year. I first saw the movie with my friend Don Hayes when his family took me with them to a drive-in theater to see the flick, that was probably late 1969 or early 1970. The secret of the films success is so easy to identify after watching the movie again, that it surprises me. There are three essential ingredients that make this movie sing. First is the star pairing of Paul Newman and Robert Redford. In old Hollywood, they say you could feel the chemistry of stars in a film. Bogart and Bacall, Tracy and Hepburn, Flynn and DeHavilland all had charisma together that made their films fly. Here is a match between same gendered co-stars that had the same effect. Their only other outing together is the Academy Award winning “The Sting“. That’s a pretty good track record for casting. From the opening sequence, the two of them showed perfect comic timing, playing off of one another’s facial expressions and body language. In the long sequence of the film where they are fleeing the pursuing super posse, they sweat and squirm and kibbutz with a real relationship that seems built on years together as outlaws. Mankiewicz mentioned some of the original choices for the film cast and I can’t imagine Jack Lemmon as Butch but I could see Steve McQueen as Sundance. Lucky for us that we had to wait for that Newman/McQueen flick until 1974. The direction of George Roy Hill is another piece to the success of the film. Hill has managed a number of films with a nostalgic feel, including “The Sting” and “The Great Waldo Pepper”. He may not have been as stylish as other film directors but he had an eye and an ear that would let the past come to light and I think his creative use of music cues, sepia tones and timing of comic scenes accouts for a lot of the reasons that people can love this movie. The first five or ten minutes of the movie look like the nickelodeon feature that plays behind the titles. When the three main characters head off to Bolivia, they make a stop in NYC near the turn of the 20th century and the photo montage delivers enough information that we don’t need the extended film sequence that had to be condensed for reasons of studio politics. The lighting choices for most of the night scenes feel very distinctive from other films at the time. Of curse he was aided by Conrad Hall’s cinematography. Finally, the most important ingredient in the whole concoction is the script by William Goldman. He had done extensive research, and for the spine of the story, the opening tag that declares “Most of What Follows is True” is mostly correct. Long time fans of “The Princess Bride” will be able to recognize the attitude of some of these characters. They are non-conformists with a wicked sense of humor and a streak of fatalism about them, for instance when Sundance turns his back on Butch as he kids that he is stealing Etta from him, he mutters “Take her”. That sounded like the Man in Black and Prince Humperdink all at once. Percy Garris mocking the two bandits turned payroll guards as Morons, is just priceless. Sheriff Bledsoe, played by Jeff Corey, speaks wisdom without the humor when he points out that times have changed and that the two outlaws have outlived their minor legend. Sundance complains about where they have landed in Bolivia, “this might be the garden spot of the whole country.” The gallows humor is abundant and it is one of the most wonderful things that Goldman contributed to the story. Goldman wrote in one of his books that this was one of two real life stories that he thought were instantly compelling and cinematic. Somehow they managed to neuter “The Ghost and the Darkness” but thank heavens this story was brought to life by the right set of artists. The movie will be playing two more times this coming Wednesday, I can’t think of anything you might be doing that would be more enjoyable for two hours than taking in this film. Get thee to a TCM/Fathom participating theater and set yourself down for the best time to be had in 1969 and so far, 2016. A minor disclaimer here, I don’t hate Michael Bay and I also have all the respect in the world for America’s fighting forces. With that said, we can get some of the political stuff out of the way. This movie does not lay the blame for the failure to protect Ambassador Chris Stevens on anyone. It does describe in detail the events of that fateful September 11, eleven years after the same date in NYC. I know there are people in that part of the world who simply want to be left alone to live their lives. Ideally under a government that protects and nurtures them. It is very hard to imagine from the first hand description provided by the men who told this story, how we are going to be able to help them do that and how we are supposed to be able to tell the good guys from the bad. This part of the world is loaded with groups armed to the teeth who want nothing less than absolute control over they fellow man. Libya and Syria are failed states that have a long way to go before diplomacy will be of much benefit. One of the striking things about the whole incident is how hopeful Americans were, including the Ambassador, and how sad it is that those hopes have largely been crushed. This film shows that it was not a lack of fortitude on the part of the Americans on the ground that are responsible for those failures. This is primarily a salute to the warriors that we have asked to go into these places to try and make a difference. If this were a work of fiction, I know that some people would be criticizing the cliche story points of men separated from their families or the comradery of warriors in battle. The reason those things are cliches however is because they are true and they mean something to the people involved. The actors and director do an outstanding job in this film in presenting men who live for this kind of service but also the way they dread the price that they pay to self actualize this way. Technically, these guys were not soldiers at the time, they were private contractors doing the job of soldiers. The story shows how the chain of command becomes problematic when this private security team, filled with the best kinds of former military personnel, has to but heads with the CIA and State department officials they are working with. Since they were employees of the agency, they deserve the status of heroes rather than mercenaries, which is a term some have used to describe these kinds of private contractors. The men in this story see their loyalty to the U.S., it’s mission in the area and the people on the ground they are there to protect. John Krasinski and James Badge Dale play the two main figures in the story, Jack and Rone. Their relationship goes back to earlier service but the work they are doing and the co-workers on their team are clearly part of a brotherhood as evidence by the loyalty they show one another. Others at the scene made sacrifices as well and all of them fit well into the stereotype of single minded military guys with hearts of gold. If half the stuff that is shown in this film is depicted accurately, they are heroes many times over. I started out by saying I’m not a hater of Michael Bay. That does not mean I will defend his “Transformers” movies, they are for the most part, loud mechanical exercises in cinematic excess. He can however build tension, stir patriotism and explode things in a way that make the story he is telling invigorating. It looks like he just needs a good story to make a good movie and here he has one. Back in 2001, he was celebrated for a shot in the trailer for the then upcoming “Pearl Harbor”. It was a point of view sequence of a torpedo bomb being dropped during the December 7th attack. The movie never lived up to the awesomeness of that shot but it was clear that he had a good eye and the technical ability to make something like that feel real to us. We are presented with a couple of similar shots in this film and they work dramatically in the climactic battle that produces the biggest emotional tolls in the film. There are a few of his other excesses on display that show he directed the film but don’t manage to take us out of the experience. John Woo likes flying birds, Michael Bay likes windblown cloth floating over the scenes of mayhem as a serene counterpoint to those events. There is a lot of shaky camera work in the film as well so if you get motion sickness let me recommend that you sit near the back of the theater. The tension in the lead up to the critical day is thick, but not nearly as deep as the tautness during the firefight. The visualization of what must have happened to Ambassador Stevens is compelling, although the final script of his death is speculative. The fight at the CIA Annex however is well documented by the men who survived it and wrote the book that this movie is based on. It is never clear who is on your side and who is simply waiting to kill you. This was an ongoing conundrum for the tech team in the compound, who needed to know who to shoot and which lives to spare. That’s a tough question to have to ask when there is gunfire and weapons all around you. It looks that the team did the best that anyone could have hoped for under the circumstances. 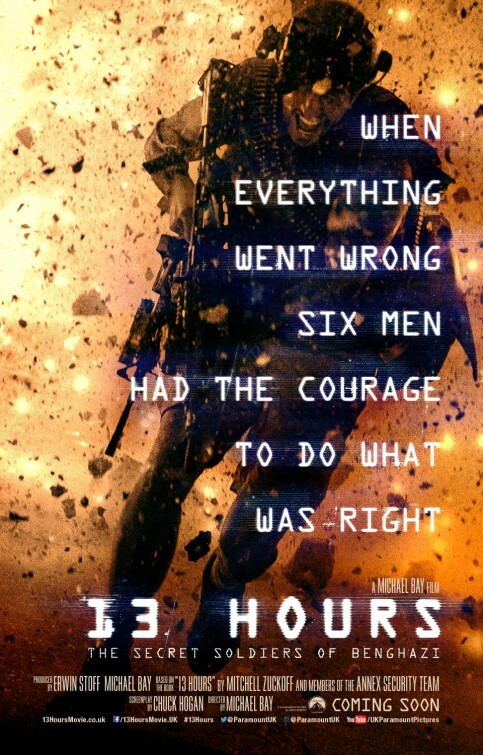 I was incredibly moved by the final screen shots of the film and it was a reminder that what we saw for the previous two hours was not a make believe story, thought up to entertain us, but a dramatization of real events, designed to honor those who gave all for their country and their fellow warriors. This is a movie that never manages to be greater than the sum of it’s parts. In fact, it might be a little less because it builds up such a strong desire to be great. Instead, it is simply good enough to dramatize it’s subject and give us an historical context, but as a movie it just seems to be lacking something. Despite the ultimately unsatisfying dramatic elements, it does contain an effective performance from star Will Smith. I can say that the N.F.L. definitely comes off as the bad guy here and that may be a just conclusion. The story may have been simplified for dramatic reasons but it comes off as a Snidely Whiplash type character, abusing it’s naive and innocent partner. The players are mostly portrayed as helpless and clueless saps who were disposed of by the league when their usefulness was done. I have incredible sympathy for the bewildering experience that some of the players in the story seem to have gone through. David Morse portrayal of Steelers legend Mike Webster is heart breaking and horrifying. The effects of CTE and the players who suffered, might be a more dramatic story to tell. Instead, we get a solid C.S.I. episode, inflated by a conspiracy theory and punctuated with the American Dream of a Nigerian immigrant. It is a hybrid of a film that is satisfying to none of those elements. 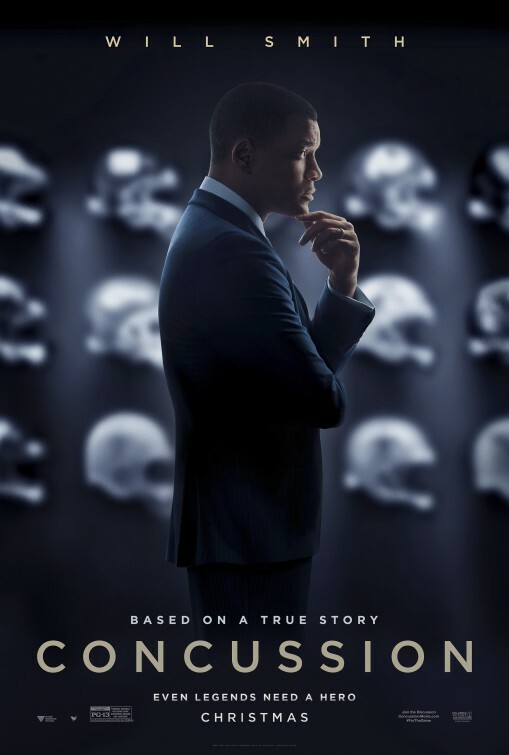 Smith plays the Dr., a pathologist in Pittsburgh, who discovers a pattern of injuries in pro football players that contributes to a variety of mental issues and suicidal/homicidal behavior. We get just enough science to know that his theory is accurate, without really understanding the explanation or the doubts that the league might have had about it. Instead, the film plays up incidents of boorish behavior by fans of the game who think the doctor is out to destroy the game. The N.F.L. is suddenly equated with the tobacco industry and the paranoia of Jeffery Wigand is transferred to Dr. Omalu. If you believe the film, agents of the N.F.L. created a Federal probe of Omalu’s boss and personal hero, cost him his job, and caused the death of his child in utero. There are long conversations where Smith’s character philosophizes on the American Dream, and seems to ache for it, but his version of the dream lacks any commitment past the facade. He is really a gifted and brilliant scientist, who lacks the ability to relate to the coworkers at his job, the sympathetic scientists who support him, or the players and fans who might be terrified by his discovery. He is given a speech at the end where he pays lip service to some of the emotional needs that come with the consequences of the disease he has discovered. The only time the position of the league is represented , the words are put into the mouth of a craven physician who is so stereotypically a sellout that he does not seem to be a real character. Will Smith does a nice job disappearing into the role of a dedicated physician, trying to solve a problem. In the long run the film comes across like a star vehicle designed to show off his chops. The accent and immigration angle are played up to give the story more narrative heft, but it is the least interesting part of the film. Roger Goodell was not having a good year before this movie came out, if it had been a bigger hit there might be something for the N.F.L. to worry about. Because the picture comes off as a polemic, instead of being an inspiring story of discovery, it tastes like medicine that might be good for us, but sometimes , the cure feels worse than the symptoms. Back in 1971, I saw the Richard Harris, John Huston film “Man in the Wilderness“. I was a Boy Scout at the time and while not an expert woodsman, I always thought that I might have what it takes to get through an experience like the one portrayed in the film. That is the fantasy of youth, that we are as great as we might aspire to be. As I watched what is essentially a remake of that film, forty-five years later, I have no illusions. If this were me, I would die. It would be painful and the cold would drive me mad before actually doing me in. The makers of the current film pile on so many obstacles that I’m not sure anyone could visualize themselves in the role that Leonardo DiCaprio plays. As a result, the movie plays less like an adventure film and more like an endurance test. It is well made and has some fantastic sequences but there is a lot to get through and some of it will test your patience. A trapper, abandoned by his party after being mortally injured, would naturally feel resentment and seek revenge on those who turned their back on him. This story is more direct in building a revenge theme specific to a particular individual than was the case in the 1971 version of the tale. 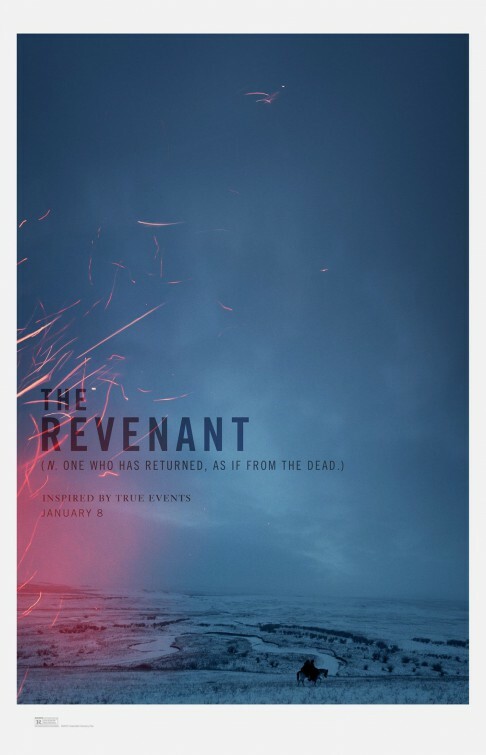 There is also a theme of forgiveness and redemption that follows the character of Hugh Glass. His struggle in punctuated with spiritual messages from past misdeeds as well as visions of his future. The Indians that are tracking him may be profiting from the raid they conduct on his companions but there is another purpose as well, one that mirrors the story of our abandoned frontiersman. It sometimes feels like an awkward attempt to add some balance to the story, but it can occasionally be confusing as well. I’m inclined to say that the film is centered around three action segments that will dazzle the audience and build immense tension. The first ten or fifteen minutes of the movie involve a violent attack on a group and there are some harsh images that will sometimes be disconcerting. It is staged in a manner that feels very natural and accurate, which makes it even more ominous as it plays out. There is a rumor going around that at Academy Screenings of the film, many older members of the body have walked out in disgust at the level of violence depicted. I don’t think it compares the “Saving Private Ryan” levels but it does take one’s breath to imagine the intensity of fear that would accompany this event. A short while later is the visual moment that will be the signature image from the film, an attack by a grizzly on the lead character, which leaves him in his near dead condition. Finally, there is a confrontation at the end of the film that quenches the thirst for revenge but also stops short of accepting the consequences of that action. It is a choice that fits in with some of the spiritual elements that the movie has advanced, but it feels like a cliche. Cliches may be the one weakness of the film. The villain of the piece is a cliche racist that eary on we might understand, but as the story develops we have less and less reason to hope for any resolution other than his annihilation. The wilderness sequences are spectacular to look at but there are so many times when an amazing idea is followed up with an obvious moment. I think I first saw an animal used the way Han uses his tauntan in the “Empire Strikes Back” in an old Robert Taylor movie. After a very creative action moment, the movie inserts a sequence much like this for no particular reason except that it is a survival film and this is one of the survival cliches that has been around a long time. Every chase has a component to it that is fresh and then a moment that is cliched. It is all shot so beautifully that you may not care, but because the pace of the film is so leisurely, I frequently found time to think about things like this. The film is almost two and a half hours long and in many places it feels that way. A little economy of storytelling would make this picture more effective, but that is not to say what we got was a disappointment, it was just not the tension filled action piece that is sold to us. There is a lot of navel gazing at times and it slows down the film enough to notice that you are watching a film. DiCaprio is fine in the movie although I did not find his performance to be the one that will finally get him his Oscar. In fact, at one point, I had to knock myself out of an internal dialogue because Leo was repeating a moment from “The Wolf of Wall Street” only this time it was for dramatic purposes rather than comedic ones. That is not the kind of thing you want in your head while you are watching an intense drama like this. Alejandro González Iñárritu makes the story visually interesting in the same way he accomplished so much in last year’s “Birdman”, but it is a little noticeable at times, also reflecting a self awareness that seems out of place. This is an excellent film and I may just be reacting to my expectations, but it did not feel as special as it has been hyped as. The story is grim with only one moment of lightness in the whole 156 minutes, and that may be one of the missing pieces for me. I need to care about the character a lot more and he is never given any personality only a mantle of spirituality that he wears like a mantle of honor, but without much clarity. A year ago, I kicked off my movie going with a trip “Back to the Future” at the Egyptian Theater. The triple feature idea apparently is now a tradition because the American Cinematique at the Egyptian offered a different New Years program this time. 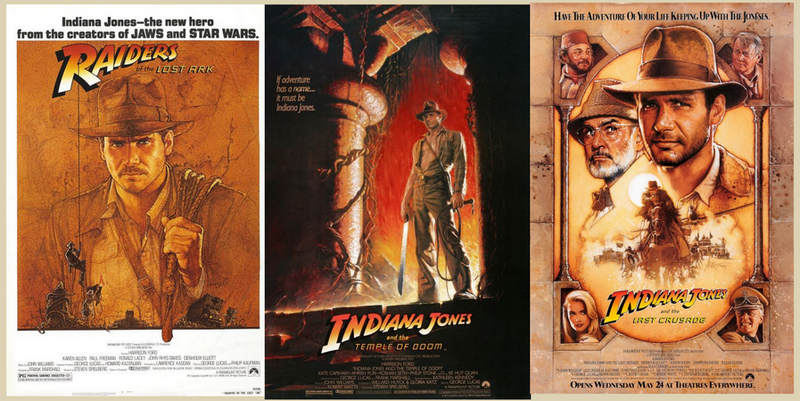 A chronological presentation of the three essential “Indiana Jones” films, with no mention of the fourth movie to spoil the evening. The three images above are very familiar to me since all of them are hanging on the hallway wall right outside my home office right now. From the very beginning, Indiana Jones has been a character that I have embraced. The films are a combination of James Bond and Errol Flynn, set in the 1930s and playing against the backdrop of the times. Critics have sometimes suggested that the movies are racist, sexist, and xenophobic but Dr. Jones is a forward thinking character in the times the films are set and his actions are always influenced by the core of his decency, not just by greed. 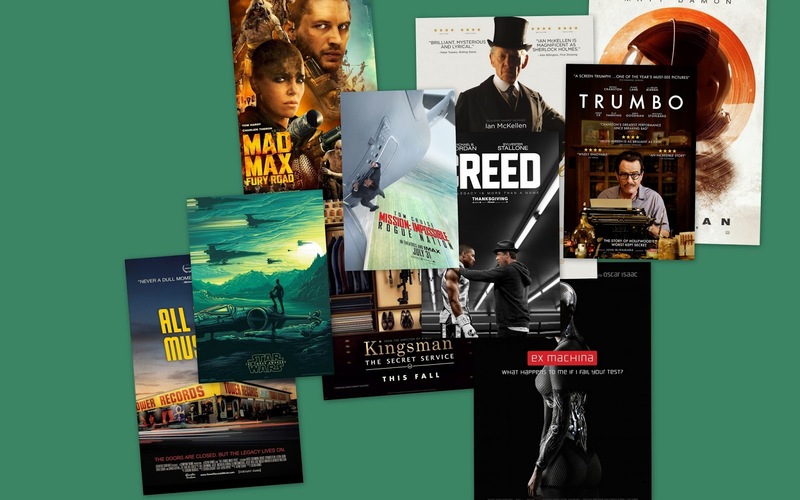 I have written about each of these movies in various contexts so this will be a short reminder with some links for you to get a more detailed reaction. I know you have all seen the films and a review is hardly necessary, these are mostly my impressions of the movies from the recent times I have encountered them. Conceived by George Lucas and Phillip Kaufman, and brought to life by Steven Spielberg, this is the most exciting action film ever. More happens in the first ten minutes of this movie than in the whole run time of most movies. Raiders is a throwback to the serials of the thirties and forties but done on a scale and budget befitting a major Hollywood production. If you click on the poster to the left, you will find a link to an IMAX screening of Raiders from about three years ago. There are certain movies that If I get a chance to see them on the big screen, I will always make the effort. This movie works on a giant movie screen because the vistas engulf you and the action scenes playout so much more clearly. In fact it was just a year and a half ago that I last saw the film in an AMC program at my local theater. I love the way Spielberg delays showing Harrison Ford’s face at the start of each of these movies. There is a creative use of shadow and light in this introduction that makes Dr. Jones a little more ominous but definitely very interesting at the start of the film. It comes right at the end of an action beat and it is a perfect first reveal of our hero. Another Spielberg touch at the start of the film is the inclusion of the Paramount logo into the titles of the movie. He is going all out to make this an immersive experience. The first sequel is actually a prequel, taking place a year before the events in “Raiders”. So maybe I am wrong in saying the screening was chronological, it was only the release dates that are chronologically followed not Dr. Jones’ adventures. If the 2008 Indiana Jones film did not exist, this would be the chapter that is most criticized. My friend Eric is particularly dismissive of it in his recent review of “Raiders“. To each his own of course. I provide a spirited defense of “Temple of Doom” on my “30 Years On” blog project about the film year of 1984. Again, we get a slow reveal of Dr. Jones as we see him from the waist down walking in a White dinner jacket down some stairs and across a nightclub floor. I enjoyed the screwball visual comedy of the action piece at the opening of the movie, but the tone of Willie Scott never gets to the Rosalind Russell/Katherine Hepburn heights it strives for. The character always remains shrill and she may well be the least loved character in all of the films despite the fact that the actress is clearly the best loved of all of Spielberg’s leading ladies. The mine car chase is the highlight of the movie for me, it combines miniatures, puppets, mattes, green screen, live sets so well to make a memorable action sequence. The pairing of Harrison Ford and Sean Connery was brilliant in my view. Connery played the character that was one of the inspirations for the whole Indiana Jones series. Lucas and Spielberg both wanted a 007 like character and in this movie they get to have 007 himself as Indy’s Dad. We also get more Marcus Brody played by the late Denholm Elliot, Indiana’s colleague at the University and here he provides the comic relief without becoming too cloying like Short Round in the second film. We also get to reconnect with the gregarious Sallah (John Rhys-Davies) from the first film as well. a Father’s day outing a couple of years ago. Sean Connery was featured in two film, “Goldfinger” and this gem. Someday I will have to do an extensive post on “Last Crusade”. I will say that it is the one film in the series that my wife saw before me. The day it opened, i dropped her off at the Chinese Theater and i went down to Fullerton to give a final exam. She bought tickets for the 10:00 am show and the 1:00 pm show. I came back and met her for that afternoon screening and she just about burst trying to keep from saying anything abouth the film that she was seeing for the second time in a row. The reveal shot in this film includes a double reveal. River Phoenix as young Indy, gets the face out of the shadows reveal that is similar to the original “Raiders” and then we get a jump cut transition with Indy’s hat to twenty-five years later, another Spielberg touch that makes this movie work so well. It was a long seven hours but worth every moment. Except for spilling half my popcorn on the poor guy in front of me, and having to pay twice as much to park as I usually do when I go to the Egyptian, it was an exceptional evening. As is customary, I will start off with a couple of reservations and caveats. To begin with, I saw fewer movies this year than I have in years. This is a function of my schedule, a new dog in the house, and a variety of other personal issues. I did make a conscious choice to postpone some of the fine pictures that will be in contention for the Academy Awards because I knew they would be coming back in the Best Picture Showcase that AMC Theaters hosts each year. I will get to see them then, and I will share my opinion before the Awards are handed out. It simply is not fair to rank movies that I did not yet see although I expect several of them would be on my list and displace films that did make it. Second, I don’t limit my personal list to just the “Best” pictures, I include films that I frankly enjoyed more than the others I saw. I like to use this opportunity to encourage people to try some things that they may have missed but that I thought were just fine. This does mean that genre pictures and action films are likely to be included, even though they are not artistic and are rather, just entertaining. After you view the video clip, you can proceed to the next page where the films will be laid out in order and there will be a brief commentary and a link to the original review. Thanks for taking the time, hope everyone will come back during the new year to get some more. A biopic that focuses on one of the Hollywood 10 from the blacklist era of the 1950s. Dalton Trumbo was an interesting character in his own right, but when combined with communist pals and the witch hunts of the time, he became a pivotal figure in Hollywood history. Bryan Cranston does Award worth work as Trumbo but he is ably assisted by a stellar cast that is also quite impressive. If you are a music lover or have any interest in the history of the California music scene, this is an essential review of one of the icons of the industry that died not to long ago. Not a figure or musician but a business, Tower Records. Assembled by Actor Colin Hanks, the film tells the story of the business model and characters behind an innovative music store that became a powerful chain but was ultimately destroyed not just by the internet but by poor business choices. To me it was fascinating stuff. As we have already established, I’m a James Bond guy. So it is quite a surprise to me that SPECTRE did not make my list of top ten films but “Mission Impossible” did. I am also a Tom Cruse fan and this is an excellent series that seems to get better as we go along. I was very impressed that the big stunt that is advertised is also the first scene in the film. That seems very Bond like to me. This story was more effectively told and the motorcycle chase by itself is worth a trip. holes and unexplained elements to the plot. It is also very derivative with story threads and action beats that repeat from earlier episodes, but J.J. Abrams manages to make us forget the prequel stories and instead focuses on new characters, old friends and practical special effects whenever possible. It may be imperfect, but it feels a hell of a lot more like Star Wars than “The Phantom Menace” did. Who would have thought that ten years after what appeared to be his swan song, Rocky Balboa would come back and endear himself to us again, and do so without getting in the ring himself. This is the right was to continue a franchise like this, find a story thread, follow it to new destinations but keep it familiar in tone. Writer/director Ryan Coogler has kept the heart of “Rocky” but managed to transplant it into a new figure that we can grow to care about as well. Politically incorrect, violent as all get out, and frequently outlandish, “Kingsman: The Secret Service” was made for 12 year old boys and anyone who can think like that. It is childish at times but also very cool and always having fun with the audience. I loved the subversive environmentalist theme and the resolution involves one of my favorite images from the film year. I saw this movie the most this year and laughed and cheered the hardest at it. Sherlock Holmes trying to solve a mystery as he is aging and losing his memory. Add into the mix that Holmes is portrayed by the marvelous Ian McKellan and you have a great concept. Put it together with some excellent production values and a clever script and the result is a movie made for grown ups that is worth the patience it sometimes demands of the audience. I first discovered Max in “The Road Warrior”. A movie that came out of nowhere, kicked you in the crouch and then owned you for the rest of your life. I went back to see the original piece which while good, is not much like it’s successor. This movie follows the template of the Road Warrior, and although Max is the titular character, the movie really belongs to the women of the film, especially Charlize Theron’s Imperator Furiosa. Ridley Scott is a director who is working at his peak still even though he is nearing eighty. Matt Damon manages to have enough charm to remain an effective and relateable hero in spite of his off screen activities. The can do attitude in this film is emblematic of my Alma maters slogan, “Fight On” and the positive spirit and large supply of humor make this a winner. However you say it, this is the most interesting film I sa this year and it has left me thinking about the themes ever since I saw it back in May. In addition to asking bit questions it is impeccably performed with a small cast and limited sets. The sets though are well imagined and the performers are terrific. The visual effects are CGI but they are used in completely appropriate ways. This is a 1970s Science Fiction film masquerading as a 2015 drama. If you have not seen it yet, get ready to have your thinking challenged. Oh, it’s also a pretty scary film as well.